MAKE LIFE MORE FRUITFUL For more than 100 years, Smucker's® has been making life more fruitful by bringing you delicious fruit spreads and smiles. With many varieties, from our apple roots to our ever-popular Pure Strawberry Jam, we've got a flavour for just about everyone. 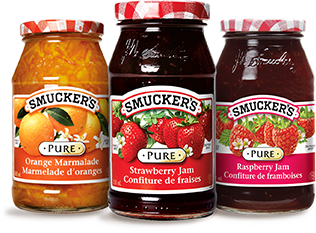 Smucker’s Pure Jams are made from a blend of crushed sun-ripened fruit and fruit puree. They’re packed with mouthwatering pieces of fruit picked at the peak of perfection, with no preservatives, artificial flavours or colours. 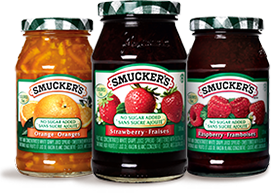 Smucker's Jelly is made from high-quality fruit juice. 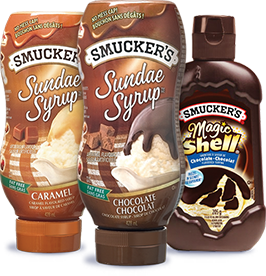 Make any meal more delicious by adding the taste of your favourite Smucker's Jelly to the menu. High quality orange zest and fresh orange juice combine to give you Smucker’s Pure Orange Marmalade - a traditional taste that’s mildly sweet yet tangy. 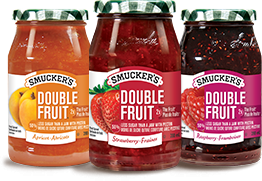 When you can’t get enough of that fruit taste, try Smucker’s® Double Fruit® Fruit Spreads. They’re packed with twice the fruit of a jam with pectin, and have half the calories of other jams!